According to Shiatsu Therapist and Bodyworker, Jan Murphy, simple steps including gentle complementary therapies can be of positive help in treating problems such as impotence, pre-menstrual syndrome and menopausal symptoms. We all know that improving our diet, giving up smoking and taking moderate exercise is good for us. All these can have a substantial impact on common women’s health problems. The trouble is, most of us are too busy, too wound up and too stressed out to stick to good resolutions even when our doctors tell us that would improve our health. What’s more, stress itself can cause these miserable conditions. So stress leads to the very problems we get stressed about. It’s Catch 22. 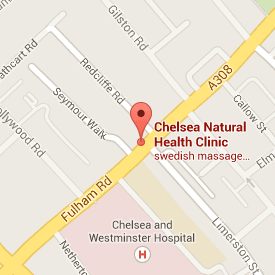 At the Chelsea Natural Health Clinic, Jan Murphy offers her clients a combination of Shiatsu, Japanese Bodywork, Nutritional advice, self-help and free advice. Shiatsu has been demonstrated to improve endometrial circulation a factor in infertility while supplements such as vitamin B6 and magnesium can have a positive effect on PMS. Techniques like yoga, meditation and visualization can even help prevent the typical hot flushes suffered by many women going through the menopause. “Complementary therapies, such as these have several benefits. ‘Of themselves, they can improve general fitness and well-being. They also make it easier for patients to do the hard things, like change their diet, give up coffee or alcohol, and stop smoking. ‘What’s more, some, such as Shiatsu, may directly affect how well conventional treatments are going to work.